The Dubliner, who has fallen to 182nd in the world and missed six of nine cuts from 10 starts (there was no cut as he finished tied fifth on his seasonal debut in the Volvo Golf Champions) had four birdies and two bogeys at TPC Louisiana. Concerned before the start about his putting and scrambling, he had 32 putts but still did well to give himself birdie chances despite hitting just six fairways. Following a short fog delay, the 42-year old hit a 100 yard wedge to 11 feet at the par-five second to dip into red figures but dropped his first shot of the day at the sixth, where he three putted for bogey after leaving a 50 footer some eight feet short. He had a chance from 10 feet at the eighth but missed that before chipping and putting to save par from right of the par three ninth to turn in level par. Harrington started the back nine well, hitting a 122-yard approach to three feet at the 10th before rolling in the putt to get to one-under par again. Amazingly, he found a found sand off the tee for the third time at a par-five at the 575-yard 11th, where he hit a 90-yard third to 10 feet but missed the putt. A glorious tee shot to four feet at the 216-yard 14th got him to two under and while he bogeyed the 15th by missing a five footer after a drive into the right rough saw him miss the green, he hit back with another birdie from five feet at the 355-yard 16th. Having missed the fairway on all the previous par-fives and made just one birdie, Harrington again missed the fairway at the 585-yard 18th and two putted for a two under 70 that will give him something positive to build on following what has been a miserable start to the season. Martin shot a 10 under par 62 to lead by two shots from Andrew Svoboda. 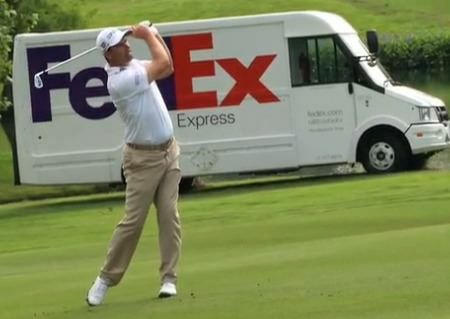 Pádraig Harrington is nine shots behind leader Ben Crane with nine holes of his third round to complete in the weather-delayed FedEx St Jude Classic in Memphis. Padraig Harrington hits his tee shot on the fifth at TPC Four Seasons Resort in Irving, Texas last night.Padraig Harrington frustratingly turned a great round into an average one when he crashed from a share of the lead to tied 24th after dropping three shots in his last six holes for an opening two under 68 in the HP Byron Nelson Classic in Texas. Pádraig Harrington got his US Open build up off to a positive start in the FexEx St Jude Classic in Memphis. Pádraig Harrington confessed that he was caught out by the speed of the greens as he opened with an otherwise solid one under 69 in the FedEx St Jude Classic in Memphis. Pádraig Harrington is hoping that his luck might finally be changing after he took advantage of some good breaks to open with a two under 68 in the Honda Classic at PGA National.